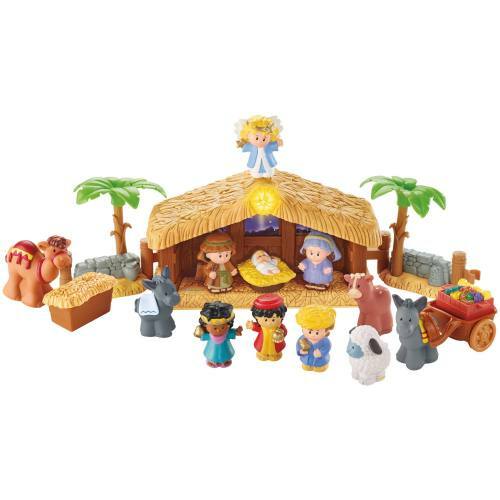 This Little People Nativity Set is appropriate for 1-5 year olds and comes with 12 figures and a manger. Figures Included: Joseph, Mary, Baby Jesus, Angel, Three Wise Men, 2 Donkeys, Camel, Sheep and Cow. Includes Stable, Left and Right Stone Walls with Palm Trees, Hay Bale, and Donkey's Cart. Press down on the angel to light up the star and hear "Away in a Manger." Batteries not included.